Playstation Japan shared several screenshots of the upcoming PS4 remaster, KINGDOM HEARTS HD 1.5+2.5 ReMix. 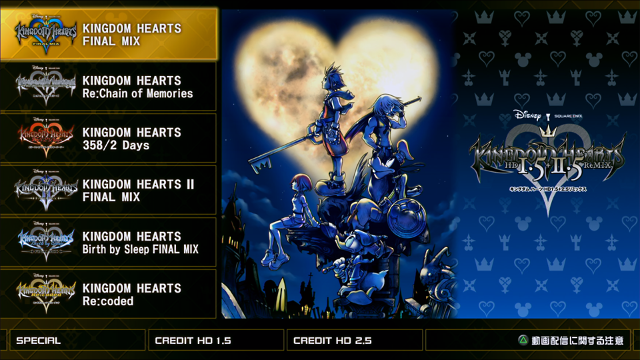 Among them is a screenshot showing off the main menu screen, featuring all 6 titles available in the collection, listed in order as they appear in the original PS3 versions. Wow, it looks really Simple and Clean. See what I did there? Huh? jokes aside though, I also thought it would look like the previous remixes. Anyways, guess this confirms that it's Days -> KH2 and not the other way around? There's a special credits like before. Noticed that. The debate will forever live on. Count me in on the KH2 before Days group. Was hoping it'd be that way for the main menu. I screamed when I saw this, it's just like FFX|X-2 HD and I love it. It's actually where the themes will be kept. Same . It just feels like that's the right way to me. But eh. Uhhh, looks just like in Final Fantasy X so far. Although, does the background change according to which game you're on on the list, too? That'd be nice! Oh, you think having 2.5 again I wouldn't know. We'll probably see a teaser, give or take. and if you beat all the games 100% a short demo of KH3 is unlocked. Can't wait for the aspect ratio to be all screwed up. I'm surprised it looks good. *sigh* I know the order is because that's how 1.5 was released, but..... PUT DAYS AFTER II DARN IT! BLAGLAGUAYBZKUYHBKJ!!! No story wise, Days in-between com and kh2, not release. I love everything about this, and it's beautiful. Well done, Square. Never thought I'd see the day when all the games were available on a single disc for a console. So awesome to see this after years of platform hopping and KH's general messiness. Finally, it's all in one spot. Well then put BBS at the top. I don't think there's any "correct" order per se. It's a matter of taste. I know lots of people who think release order is king, but personally I find the narrative flows better when you play Days before KH2. personally i think kh2 before days is better as a big part of that opening (and of the org in general) is the mystery. who is roxas, how is he connected to sora, where is he now, what is the nature of this world, who is the organization, what is their goal, what are nobodies, what do they look like, etc. I like this new layout a lot! I was afraid it would just be a screen that said 1.5 + 2.5 with six ugly gray squares with the game titles like it is with the other collections.